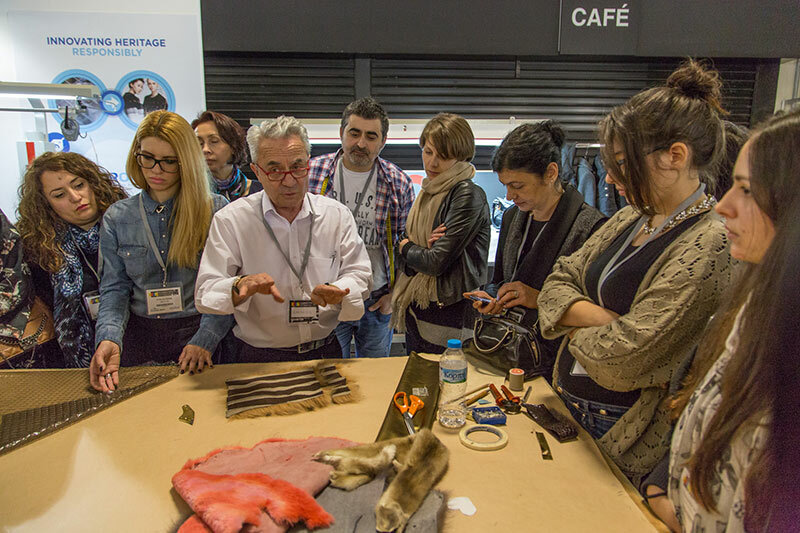 Attracting a great interest and with more than 50 students participating from various design schools in Greece, the two Discovering Fur Excellence WORKSHOPS were successfully organized during the International Fur Fair “Fur Excellence in Athens 2015” WORKSHOPS were successfully organized during the International Fur Fair “Fur Excellence in Athens 2015”. With the theme “Let us take a line for a walk”the Professor of Royal College of Art-London and HAF collaborator Mr. Vasilis Kardasis traveled attendees to the world of fur triggering their imagination. Like last year, the seminars were experiential as participants were able not only to see and learn about the fur material but also work with it in the model furriery workshop that wasnear-by, just for this purpose. Experienced craftsmen presented the manufacturing process of fur garments while helping participants realize their ideas. Participants received their creations and their seminar certificates at the end expressing their deep desire for such initiatives to be repeated in the future as they were overwhelmed by the possibilities to express their creativity through the fur material. This year the sponsorship of this creative field was undertaken, apart from the TSOP furriery machinery company that has enthusiastically supported this venturesince the first year, by the HellenicFur Federation and Fur Europe, declaring in action their support for the activities of the Hellenic Association of Furriers. The companies that supported this action offering free machinery, tools and materials, mannequins, leather and other ready-made garments for presentation were the companies – members of HAF: CPL, DTS, EXPOPEL, GLOW, KN Furs, LANGIOTTI and LUXOR.